Are you always worried of unauthorized access to your reports, notes and other works, while you are not at your computer? Do you feel that that there is a risk of tampering of your files while you are away or someone else is operating your computer - may be some colleague or your kids? Now no more worries for you! 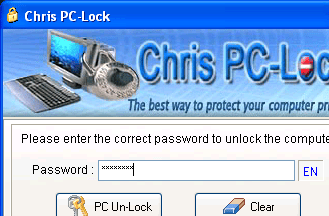 Chris PC-Lock 2.50 is a perfect shareware tool for you, which will lock your keyboard with a password. Now no one can damage your work intentionally or unintentionally, how hard he may try using your keyboard. So just enjoy your leisure time. You can also set an auto lock that activates, if your computer is inactive for a particular period of time. Thus if you move out of work urgently then also your work is absolutely safe. Also when it is locked all the features of task manager are inaccessible. It also doesn’t allow the shortcuts like ALT+F4, CTRL+ALT+DEL or ALT+TAB for access. Ideal for your office computers, Laptops, this application works best on Windows platform of any version. It activates the set wallpapers or screensaver on the display during the lock period. You can also quickly lock your computer by clicking the Chris PC-Lock icon in the tray bar. The application also allows you to change the setting of your locking system at any moment of time. This application is a must have to secure your computer easily and comprehensively. Locks the keyboard of your laptop or desktop PC and prompts a dialog box for password. Entering the correct password will unlock the computer. A powerful and useful feature for any user, to lock automatically the computer after an inactivity/idle period, that can be set in minutes.Easy setting/change of your unlock password from the configuration screen. In the lock mode, it fully disables access to the task manager of Windows 9X/ME/200X/XP operating system, therefore any unauthorized keyboard access to your system will fail. Any attempt to press shortcuts like ALT+F4, CTRL+ALT+DEL or ALT+TAB will fail, prompting the input password dialog box to unlock. he lock screen can be set to any custom wallpaper or slideshow, by a simply setting the picture path or the pictures' folder. A more advanced feature lets you set the transparency of the lock screen wallpaper, giving you a close feeling of the current Windows desktop status. Entering in lock mode can be fast by pressing your custom defined shortcut. Chris PC-Lock has an icon in the tray bar, which gives a fast mouse access to the lock mode and lock settings. Multilanguage support, the following languages are available : English, German, Dutch, Romanian. In the lock mode the mouse and cursor are hidden after a certain idle time. Stealth-mode to protect you more.